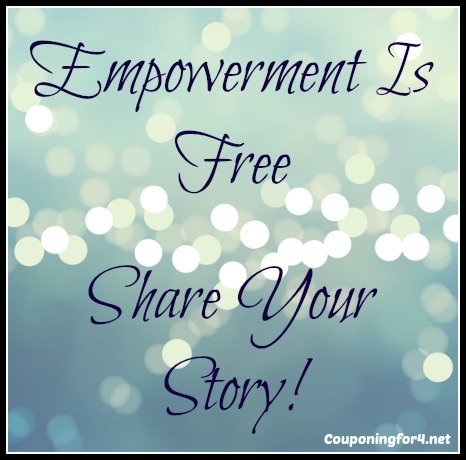 Empowerment Is Free: Share Your Story! Empowering people and sharing stories of empowerment have become my passion over the last few years. I think that it is actually one of the most helpful things that you can do for yourself. Hearing other people’s stories – finding the kernel that you relate to – and letting it impact your life. It is a special relationship that you are building. I am extremely excited to announce that I am working on a new project (which I will tell you much more about soon!) and I would love to share your stories. We all have stories of empowerment to share and I encourage you to own your truth and your history and, if you are comfortable enough, share these stories with my audience. Empowerment is achieved in countless ways, so these stories can range from being a survivor of abuse or illness to finding a way to get out of debt and beyond. Your story can be as long or as short as you feel comfortable with and I am more than happy to answer any questions or concerns that you may have. This is a family friendly site, so all I do ask is that you please keep that in mind in regards to language. You are welcome to email your stories or questions to couponingfor4 (at) gmail (dot) com and we can go from there! Like I said, everyone has a story of empowerment, whether you think that you do or not. And if you can’t remember anything today, be open to thinking back on your experiences and what someone else may learn from situations went through. My goal is to create a community of empowerment and I so look forward to sharing that with you very soon.